The tea gardens of ‘Terai and Dooars’ whose scenic beauty and unparalleled flavour of tea have gained world reputation, whereas the suffering, perennial misery and insecurity of garden workers remain unheard and ignored by the State administration. Banglar Manabadhikar Suraksha Mancha (MASUM) intends to share with alleged malnutrition-led-death of workers at various tea estates of North Bengal through the various print and electronic media. Being a member civil society organization, we have made a vow to stand by them and urged the commission to play more pivotal role in providing justice to the tea garden workers and their families. The plight of sick and abandoned gardens is unimaginable. They have denied all types of livelihood opportunities without workers fault. We want to express our concern of the miserable condition of tea garden workers; both permanent and casual, at Birpara tea garden and request you for appropriate actions. In this regard, we already submitted two complaints of starvation deaths of tea workers at Bagrakota and Madarihat tea gardens for your perusal on 8.03.2016 and on 22.03.2016 respectively. The tea gardens of ‘Terai and Dooars’ whose scenic beauty and unparalleled flavour of tea have gained world reputation, whereas the suffering, perennial misery and insecurity of garden workers remain unheard and ignored by the State administration. Reportedly, more than 30 tea garden workers have died due to acute malnutrition and starvation in this garden since January 2015. To gauge the situation, MASUM constituted a fact-finding team and toured Birpara tea garden in the wake of a number of starvation deaths reported from the tea gardens owned by Dunkan Industries, Kolkata. The team conducted door to door extensive survey at labour quarters of Birpara tea garden to understand the conditions of the tea garden workers. The team met different trade union activists working in tea garden, met worker families belonging to closed Birpara tea garden. MASUM team visited different labour colonies, Block Primary Health Center (BPHC), public drinking water sources, etc. and gathered information. Birpara tea garden was established in 1931 now at Alipurduar district of West Bengal and has affiliation with Dooars Branch of Indian Tea Association. Birpara, one of the largest tea estates in Duncans Industries Limited, has been closed down since March, 2015. While the 1,529.4 hectare Birpara tea garden once boasted nearly 2,025 permanent workers on its rolls besides over 1,100 temporary workers. The 1332 families are dependent on Birpara tea garden. The factory, which had strength of almost 250 factory staffs, now has no staff left, including clerks and accountants. There are 90% ‘Adivasis’(aborigine) at Birpara tea garden. The Adivasi workers have been living in the tea garden for generations, tracing their lineage to their forefathers, whom the owners brought from Jharkhand region of Bihar, Jharkhand, Odisha, and Chhattisgarh states. At the beginning of March-April 2015, the Duncan Industries unofficially closed down the garden alike other gardens (owned by Duncans) in the Dooars and Tarai region of North Bengal, throwing the lives of workers off-gear, with wages and salaries and statutory dues remaining unpaid. While the staffers have not been paid since March, last year, rumours that salaries are still being credited to the managers’ accounts. Now the managers keep away from the estate after the payments stopped, fearing a backlash. With tea garden owners leaving their workers to fend for themselves, creates a grim scenario of large-scale starvation deaths as there are no other means of income. It was revealed during the fact finding that the average age of bushes crossing 50 years and production was considerably going down. Garden owner know the fact but did not take any initiative to harvest new tea sapling. It was reported that, more than 30 workers had died owing to mal-nutrition related diseases. “The management began to run the gardens in the absentee Zamindari style. Reaping profit from the gardens was their main target. Quality improvements and investments in the gardens became secondary. To minimize cost, cutting benefits to the workers and later apathy to increase their wages properly as it was running well; turned out to be the main reasons behind turbulence in the gardens.” One veteran worker of the tea garden said. “Since our pay was higher than the garden workers people think we’re doing fine. We’re lower middle class people with aspirations and more debts than the workers,” over the walk to the garden Mr. Robinson Kujur, one factory staff said. He stated while reports on malnutrition deaths are taking into account the concern of pickers and other ground staffers living in ‘coolie lines’ at garden but no one is talking about the sufferings of the office staffers. He pointed out that Samir De, a 42-year-old X-ray technician at the garden hospital died on October 18 because he could not afford his medicines. According to Robinson, Birpara is on the brink of chaos and once there are no more leaves to pluck, people will start selling off their household equipment. A number of children have also left school because their parents cannot afford the fees any more, said Manoj Singh, one of the office staffers. A yellow bus that used to take children of the garden workers to the nearby schools has been left abandoned because of no money for fuel. In tea gardens, the management provides not just wages but also housing, electricity, water, ration and health care as per Plantation Labour Act, 1951. Most of the young men have joined the list of migratory workers in other States. It has been reported that, they are now seasonal labourer in Kerala. Many men of the estate have left for Delhi as construction workers. The old and the infirm, continue to live in their quarters without electricity, water or any wages, as owner have simply disappeared leaving them to their fate. In Birpara, after the closure of the food distribution system, the families have been brought under the Antyodaya Anna Yojana (AAY) scheme but the amount of food grains reaching them is less than half of what they should be getting, the findings show. Reportedly, Block Development Officer, Madarihat-Birpara has taken initiative to provide 3 kg and 750 gram rice and 5 kg wheat at a rate of 2 rupees and 200 ml kerosene per week per worker. The scheme has started recently by appointing G.R. Dealer at Birpara. But workers say they get less than half the amount of food they used to have, and it simply is not enough. The erratic supply of commodities in the ration shops force workers to go to the black marketers. Ironically, most permanent workers held APL (Above Poverty Line) ration card, deprived of subsidized food grains and other benefits that they can get if they have BPL card. Casual workers have not got any facility either under BPL or APL. The estate hospital is poorly maintained. There is an abysmal situation in medical facility and deliverance. Only outdoor unit is open, which are still run by the two compounders, have no medicines. A section of people who were dying in the tea plantation could have been saved if the estate hospital were functioning normally. Worst sufferers are women, kids and old. It was reported, people have died due to lack of proper medicines at right time. There are many cases of women workers dying during childbirth.There are no ambulances available to take the seriously ill or injured workers for advanced medical care to the city hospitals. There is neither supervision nor punishments if compounder errs. In the estate, the hospital exists only for name sake. The ff team visited doctor’s quarter with an intention to talk with him. But his quarter was locked and we could not contact him over phone also. Mr. Robinson Kajur, who was the guide of us said, “The MBBS doctors who have been posted in the hospital, are now practicing elsewhere outside the tea garden to maintain their livelihood.” How to check these irregularities is a big question. As per provision of Plantation Labour Act, 1951 the owner is responsible for providing house and repairing and maintenance thereof for their workers. Houses at the labour lines are in a deplorable condition. We spoke with few of the women workers and they mentioned that the houses posed more danger than being protection for them. During monsoon the water would enter the house from the holes in the walls causing number of diseases and damaging their belonging. Now, workers have to incur repairing expenses but they have no money left to repair their houses. In the estate, workers have not been getting winter clothes, rain coats and shoes for years together. Even if supplied, it would be of a low quality one. Latrine facility in the quarters is not up to the mark. There is a drain inside the quarter but not connecting with toilet or latrine causes contamination of used water with ground water. Poor access to sanitation and latrine; this has made them more susceptible to diseases fungal and respiratory infections and diarrhea. 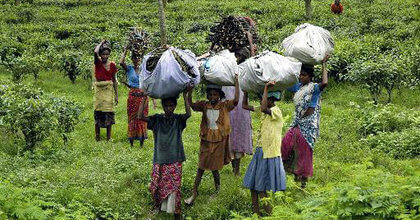 In Birpara tea garden workers face problem of fuel. Due to lack of forests and strict implementation of environmental laws lot of restrictions have been imposed on firewood cutting. Power supply at the labour line is absolutely inadequate. Only factory staffs have managed electricity for their household. Earlier, bulk power was given to the management which in turn distributed it to workers’ quarters. So the Electricity department is charging electricity bill on commercial rates not on domestic rates. This has become another hardship where they have limited power supply. The trade unions have been asked to collect applications from the workers after consulting the electricity board. The power company has also been instructed to give connection to every household through domestic meter. Management bears the rest. But after closing down of the garden, there is no progress of electrification of households of the worker. “Crippling power supply at garden health center causes damage of medicines.” Sonali Chakraborty, on duty medical staff lamented. Due to erratic supply of electricity, even NGO run health camps fail to make health examinations of the workers. Later the team visited the factory where tea leaves are processed and packed for transport and sale. But the factory and factory staff office was completely shut down, most of the machinery was damaged. Office documents were lying scattered here and there. Drinking water too is in short supply at labour quarters and water from non-drinking general supply, even when boiled, is not hygienic. The water gets reddish with iron rust content. Because of less supply of water there is a growing instance of disputes among workers. Management has failed to provide safe drinking water. “The supply of water through pipe lines in labour line has been extremely inadequate for which the families have been suffering beyond description. During summer season in particular when requirement of water is more, sufferings of the people for want of water increases leaps and bound. Requirement of water which is passing through smaller diameter of water pipes for the last many years, in order to improve the situation it is of paramount necessity to replace the existing water pipes with bigger diameter immediately.” Mr. Robinson Kujur (factory staff), who accompanied us to the garden, said. There are few tube wells in the garden but most of them are working due to lack of maintenance. Most of the hand pumps need repairs. Due to lack of safe water this people are suffering from abdominal pain, rashes on skin, and other water born deceases. One surprising thing is that, the local administration is not serious about this issue even after getting many reports and repeated requests by unions and workers. Women do most of the plucking work at tea garden; ironically, they are the most sufferers. They are restricted by a lack of skills. Education, health is far of dream for them. The closure of tea garden, poverty, hunger and malnutrition has propelled women trafficking from Birpara tea garden like other tea gardens of Dooars and Tarai region. “Mostly young girls in between 14 to 22 are being trafficked for flesh trade and the girls have willingly gone and having their place at brothel of Delhi and Mumbai. Even, the family members are allegedly being forced their young girls to take up prostitution for survival. Reportedly, women from the tea garden keep going to Delhi, Bangalore and other metros of the country and took up jobs as a domestic help; to earn their living.” Robinson Kajur, expressed. He further added, “In the tea garden, sexual and reproductive right of young girls has been grossly violated. They are being married at an early age. Most of the parents of the girl child want to marry their daughter at early age due to extreme poverty and unable to fulfill their basic duties as parents.” Motherhood in childhood is remaining an everyday occurrence in the tea garden. “We do get work under MGNREGA but the money is delayed by several months. I got one month work in January but the money has not yet arrived. How can we sustain in this manner?” one workers said. People are ashamed to speak of their poverty. Children attend school as they get to eat under the ICDS scheme but they have no future. We now look for jobs under MGNREGA though the money is delayed.” Raghu Oraon, one young worker said. Very few permanent workers have got Rs 1,000 per month under the FAWLOI (Financial Assistance for Workers of Locked out Industrial Units) scheme. But larger part of workers have not benefited from the scheme. The trade unions are indifferent and the workers remain deprived. There is no implementation of National Old Age Pension (NOAP) Scheme, Rajiv Gandhi Shramik Kalyan Yojana, Rajib Gabdhi Village Electrification Scheme, Rajib Gandhi Home Scheme, BPL cards, unemployment allowance etc. Recently, trade union leaders, factory staffs (officials at the tea estate) and garden workers get together to form an operating managing committee (OMC)—a system that has flourished with state support. The leaf collected is either sold to other estates or factories that do not have plantations. Workers get paid a pittance. Reportedly, in this garden, lion’s share is siphoned off by union leaders and politicians. However the OMC can at best be a stopgap arrangement. It is not a solution. It was revealed that management’s attitude is the main reason for the crisis. The state government is not effectively performing its responsibility. It denies starvation deaths, lack of basic facilities and making claims that the state government is providing all types of food materials. But at ground level nothing has been implemented properly. Many “Adivasis” at tea gardens are not yet recognised as Scheduled Tribes in West Bengal. Due to this, they are denied statutory benefits like education and employment. A case of alleged non-payment of wages in the tea garden has also been lodged by the Criminal Investigation Department against Duncan Industries in north Bengal. But it is sub-judice. One application was filed as writ petition (WP-4225W/2016) before the Calcutta High Court highlighting the problems of tea garden workers, arising from the present crisis in the industry as well as long term issues. In this regard, we urged the commission to take necessary step in providing justice to the tea garden workers and their families. Closed and abandoned tea estates must be reopened immediately. Provide sufficient food grains to the tea garden workers. As there are starvation cases, provide 35 kg rice per person per month for closed garden compulsorily under food security act. Make a special provision and recognize all tea garden workers as BPL cards holders and provide food grains and other livelihood facilities. Immediate action is needed by the District authorities to provide power supply to labour quarters, safe drinking water and repairing of all tube wells. One water treatment plant must be constructed there for safe drinking water. Extend all medical facilities with improvement of garden hospital. Recognise all Adivasis of Birpara Tea garden as Scheduled Tribes and provide all statutory benefits. Backlog of unpaid wages along with provident fund and gratuity should be cleared without delay. Make it a criminal offense for the tea garden owners to abandon their tea gardens, or fail to provide them necessary wages and benefits that are stipulated by the law.